Couscous and chargrilled vegetables in a lemon and basil dressing. 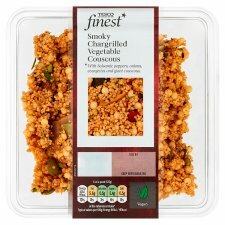 Tesco Smoky Chargrilled Vegetable Couscous. With balsamic peppers, onions, courgettes and giant couscous. With balsamic peppers, onions, courgettes and giant couscous. INGREDIENTS: Chargrilled Vegetables (28%) (Yellow Pepper, Red Onion, Courgette, Red Pepper, Olive Oil, Balsamic vinegar [White Wine Vinegar, Grape Must Concentrate], Garlic Purée, Oregano), Cooked Giant Couscous (25%) (Water, Durum Wheat Semolina), Rehydrated Couscous (Wheat), Water, Red Wine Vinegar, Lemon Juice, Pumpkin Seed, Rapeseed Oil, Tomato Purée, Parsley, Sugar, Basil Infused Sunflower Oil, Smoked Paprika, Garlic Purée, Salt, Mustard Seed, Black Pepper, Spirit Vinegar, Red Chilli, Oregano, Coriander, Cornflour, Ground Bay Leaf, Tomato Passata, Ginger Purée, Turmeric.